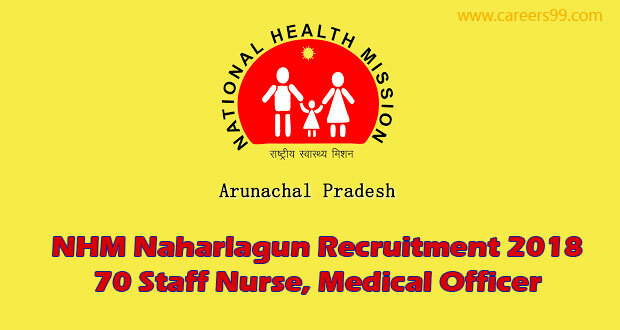 NHM Arunachal Pradesh Recruitment 2018 – Apply Offline for Cardiologist, MO & Other Posts: Directorate of Health Services (DHS), Naharlagun, Arunachal Pradesh (DHS Arunachal Pradesh)has advertised a notification for the recruitment of 70 posts of Cardiologist, MO & Other vacancies. Eligible candidates can apply online from 01.02.2018 to 19.02.2018 upto 4PM. Other details like age limit, educational qualification, selection process & how to apply for DHS Arunachal Pradesh Jobs are given below. Interested candidates those want to apply for DHS Arunachal Pradesh Cardiologist, MO & Other posts must having following educational qualifications. Min – 18 to Max – 45 years of age. Eligible and Interested Aspirants are requested to Download Application Form from Below link of nrhmarunachal.gov.in Website and Submit it to the mentioned Address before Last Date i.e., 19.02.2018 upto 4PM.